Serene: Temples pepper the plain in the ancient city Bagan. The budget airplane to Mandalay was rolling along the apron of Bangkok’s Don Mueang Airport ready for take off. The flight attendants — all with model good looks — were giving safety instructions. Excitement started to swell in me. In just one-and-a-half hours, I would land in Myanmar: the fast-changing homeland of Aung San Suu Kyi. The plane picked up speed. There was no turning back. I flicked through my guidebook, a Lonely Planet published in 2011 that I bought months before but had not read. It seemed appropriate to read the “need to know” page before touching down. My eye scanned a heading printed in blue font: “cash-only economy”. My heart rate quickened. “Myanmar ATMs don’t accept international cards”. It continued: “Budget carefully and get the right kind of bills before your plane lands in Yangon. Otherwise, you’ll end up in financial trouble”. I was a couple of hundred feet in the air already. I landed in Mandalay and was sure I was in trouble. With only Rp 600,000 (US$58.2) in my pocket and not a single dollar or kyat in hand, I had visions of sleeping on the streets of Mandalay before making my way to the Indonesian consulate in Yangon to beg them to take me in. I had been feeling that Myanmar was calling me to visit. The military junta finally released opposition leader Aung San Suu Kyi after years of house arrest in 2010. News reports from Myanmar’s Rakhine state detailed the deadly ethnic and religious conflicts between Burmese Buddhists and Rohingya Muslims. There seemed to a parallel to Indonesia, which overthrew its despot long before Myanmar, and which has also been struggling with religious conflict. My one-week plan was to visit the dusty commercial town of Mandalay, made famous by songs inspired by Rudyard Kipling’s poem Road to Mandalay, followed by a stop at the ancient city Bagan, where thousands of red-brick pagodas stretch across the plains. While there are no direct flights from Jakarta to Yangon or Mandalay, the cities with international airports in Myanmar, budget airlines such as Air Asia serve routes such as Singapore-Yangon or Bangkok-Yangon and Bangkok-Mandalay. The country is transitioning from a reclusive dictatorship hit hard by embargoes to a nation eyed by foreign investors. The economic sanctions that cut off Myanmar (and its ATMs) from the rest of the world were lifted last year. This saved me from a life of indigence on the streets of Mandalay, as I found that the ATMs there and Bagan did indeed accept international cards, thank you very much. Mandalay, the capital of Burma before the British takeover in 1885, is a bustling town with rows of five-story buildings. Here and there, you will find monasteries with lush trees. While Buddhism is the religion of the majority of Mandalay population, it’s a city of many different faiths. Min, the taxi driver who took me around, said that his wife was Roman Catholic, while he was a Buddhist who believes in nats (spirits). In honor of his wife, he can recite the Lord’s Prayer. If flying on Air Asia, the airline provides free shuttle bus from the airport to the city, which is an hour’s ride. Mid-range hotels costing between $20 and $40 a night are plentiful. I chose the Royal City Hotel, which had a rooftop terrace that was good for watching the sunset. Also visible from the rooftop of the hotel, which was near the Mandalay Palace, were the dome of a mosque, the spire of a church and the stupas of the pagoda — as well as ubiquitous satellite-dishes buildings. Take a boat from the pier to Mingun Paya and climb the giant unfinished red brick stupa. A self-appointed guide said that it was forbidden to climb, as there are cracks and deep cuts between the bricks due to an earthquake. However, teenage boys and young couples were climbing the structure anyway, and I followed suit. From atop Mingun, you can see the river cutting through Mandalay and the white pagodas from afar. Beautiful: Whitewashed pagodas surround the Kuthodaw Pagoda in Mandalay. Mandalay city itself is home to interesting places to discover. There is a Big Ben replica in the Ma Soe Yein Nu Kyaung monastery, where hundreds of monks in red robes wander about in the compound carrying books. A friendly monk gave me a tour after seeing me taking pictures of the clock. We entered a meditation building where the fifth floor was a prayer, complete with a statue of Buddha and fake mango trees. The beautiful teak monastery Shwe In Bin Kyaung is worth a visit. Mango trees surround the compound, with fruit falling to the ground. Flocks of crows can be seen flitting from branch to branch above the meditation house where people sit silently for hours. with liquid face powder from Jataka trees walk along the bridge to school. The Burmese use the face paint to protect their skin from sunburn, says Min. On the road: Girls walk to school over the U Bein Bridge in Amarapura. Due to time limitations, I chose to fly to Bagan from Mandalay. Another option would have been to take a two-day boat trip along Irrawaddy River. Flying has its advantage though as you can see the thousands of Buddhist temples across the plains. 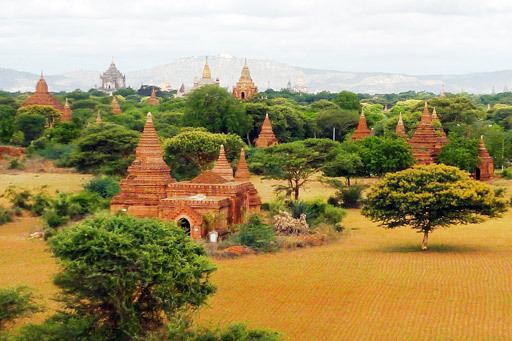 According to the Lonely Planet Guidebook, the Bagan temples were built during a two-and-a half century building burst that began during the reign of Anawrahta, who developed an edifice complex after converting to Theravada Buddhism in the 11th century. His successors continued his building frenzy. The result is a magnificent sight. Without any other modern buildings — only the domes of the pagoda — I felt as if I was journeying not only to another place, but to another time. To explore the temples, bicycle rentals are an inexpensive and convenient choice. A strange security policy in Bagan bans foreigners from riding motorbikes, according Aung Myo, a taxi driver in Bagan. He said that even riding as a passenger was not allowed. I rode my rental bike on dirt road that led to mysterious temples. Sticking to the dirt road will ensure that you avoid other tourists too. It is still possible in Bagan to sit on top of a pagoda by yourself while watching the sunset over the horizon. The times, however, are changing in Myanmar. So, pack your bags and go.